So, for a while, I wanted to become the first female president. My parents had responded proudly to my brother when he’d put his dibs on this goal a few years earlier, so when he gave it up to pursue his dream of playing professional basketball, I saw an opening. I announced my plans one evening after my mom had made beef stroganoff, when I knew my parents would be more receptive. “No,” came my dad’s voice flatly from across the room where his face was hidden in that morning’s newspaper. I couldn’t see his expression and was convinced that he was joking, but when I ran over to him and pulled the paper down, I could see from the look on his face that he was dead serious, and apparently annoyed by my question. Fearing that my own father would have to take it upon himself and his large gun collection to keep me from running, I retracted my declaration on the spot. My dreams of grandeur did not stop there, though. If I couldn’t be president, I would be the next best thing: I was going to be a model. And not just any model, a J.C. Penney catalog model. 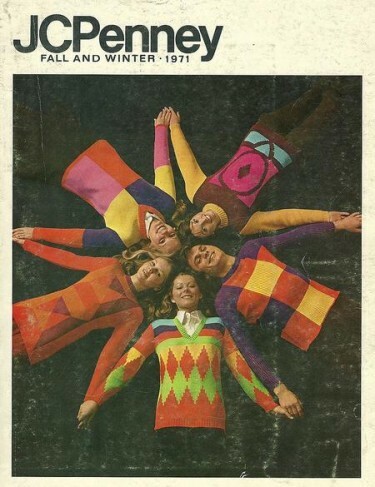 Until I was 13, the two biggest highlights of my year — with the exception of gift-receiving holidays — were receiving the J.C. Penney Spring/Summer and Fall/Winter catalogs in the mail. I’d flip through the women’s section until the pages fell out. To a home-schooled teenager in Aberdeen, Washington, it was Vogue. I secretly held a fantasy that one day I would be on those pages, posing in my flared Arizona Jeans Company denim. The only thing I knew about modeling was that you had to be tall, beautiful, and very, very thin. I was tall. I convinced myself that my enthusiasm and willingness to pose in the plus-size section would make up for whatever I lacked. I didn’t tell anyone about my dream until the 1996 Fall/Winter issue arrived. That year, on page 396 of the juniors section, there was a beautiful, long-haired brunette wearing a tiny plaid t-shirt and tight jeans smiling suggestively at the camera. I was inspired to confess my dream to my family. Who knew, maybe if my parents saw how committed I was to this endeavor, there could be a trip to Seattle’s Barbizon School of Modeling in my future. And, if I looked the part, it would be so much easier to tell my family what I wanted to do. And this was a look I knew I could recreate. I locked myself in the bathroom for two hours, curling my hair and using my mom’s makeup. I was limited in my options there, as her daily makeup consists of black liquid eyeliner, red rose blush, and fuchsia lipstick, but I did my best. I didn’t want my family to see me until everything was perfect, so once I’d finished making my face look like something Dolly Parton would have considered garish, I snuck back into my bedroom to select my clothes. When I had first seen the picture, I had thought I would be able to recreate the outfit exactly, but after a careful re-review of my wardrobe, I realized there would have to be a few minor alterations. I owned plenty of plaid, but it was all long sleeved and flannel, so I decided to put on my best hole-free plaid button down and just roll up the sleeves. It wasn’t tight and baby blue like the one in the picture, it was maroon and green, but the color wouldn’t matter — I just had to accessorize. I tucked the men’s shirt into my size 16 tapered K-Mart jeans and looked in the mirror. It still didn’t quite look right. I added a braided leather belt and an oversized denim newsboy cap. Now we were getting somewhere. I put on the black patent leather pumps that I was only allowed to wear to church and gave myself a thorough once-over. I could totally pass for a model! I knew my parents would be proud. Modeling was definitely a feminine job, it was about as far away from politics as I could get, and I was going to make lots of money at it. I strutted out into our kitchen, doing my best model walk — which I had learned from watching years of Miss America pageants — but my mom had just mopped the tile floor, so it was kind of slippery. As soon as I stepped on it, picking my feet up like I was walking through a mud field, I tripped and fell across the kitchen counter. Before my family could react, I jumped back up into standing position, repositioned my cockeyed denim newsboy cap, and continued my strut. I was thrown. This wasn’t how I had planned on telling them. I was supposed to walk out, have her take one look at me, and insist on calling Barbizon immediately. “Mom!” I finally blurted out, “I’m going to be a J.C. Penney catalog model!” She and my brother looked at each other, and then burst out laughing. They laughed at me until their faces were red and tears rolled down their cheeks. I think my brother fell to the floor. Until that point in my life, the only time I’d ever seen my mother laugh that hard was at a John Candy movie. I ran back to my room and slammed the door. I ripped off the hat and the oversize flannel shirt and cried. After a while, my mom realized I’d been serious and came in to console me. She sat down next to me and put her arm around me. So, much to my mom’s dismay, I became a writer. Now, when she tells me that I’m never going to make any money from it, I remind her that I’m not a stripper or a whore. Shanna Green is a 5 in a city full of 10s, but at least her cat has an IMDb page. You can read more of her mundane musings at averageinla.tumblr.com.